Eight months on the “Balkan route” have cut Sirvan’s* childhood short. He and his parents escaped from the hardships of their home country Iraq to look for a safer home and have been on the road since. Their desired destination country is France, but at the moment, they spend long summer days and nights in an abandoned boarding school in Bihac, north-western Bosnia and Herzegovina (BiH). They came to Bihac via the so-called “Balkan route” that refugees and migrants use to reach EU countries. They tried to cross the border to Croatia three times already, but each time the border police turned them back. "It’s not good here, we have nothing. One meal a day and everyday there is fighting. Now we don’t have money to continue the travel and my mother has a problem with back pain, so she cannot walk for a long time,” Sirvan* tells us, about their current situation. 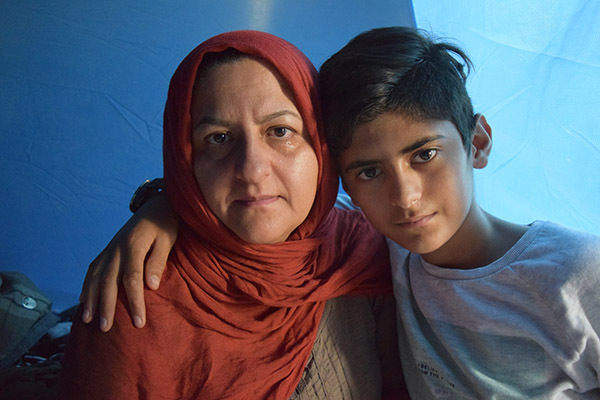 For two weeks his parents and himself have been living in a tent in a destroyed building with no electricity or running water. Instead of worrying about school and usual teenage worries, Sirvan* was forced to grow up early and worry about the safety and wellbeing of his family. And yet, we hope we managed to bring him back to his childhood at least for an hour. 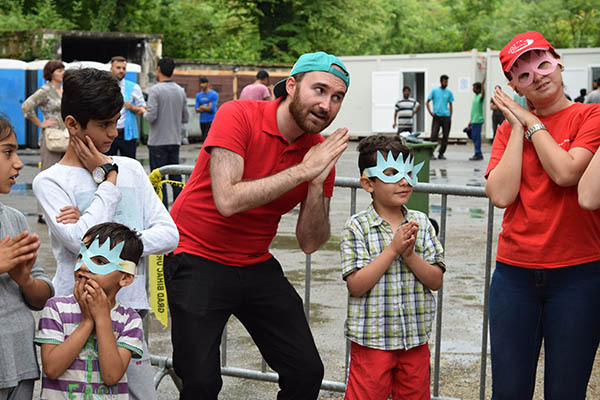 He joined us at the very first workshop held for refugee and migrant children in BiH by the mobile Child Friendly Space set up by Save the Children, in partnership with local organisation Žene sa Une and with UNICEF’s support. This was a chance to gather children around and give them a worry-free hour of arts and music workshop. This workshop also represents the beginning of Save the Children’s humanitarian response to refugee/migrant crisis in BiH. Namely, according to data released by International Organisation for Migration (IOM), 6,700 illegal migrants were registered in 2018 on the new Balkan route, originating from Greece, through Albania, Montenegro, BiH to Croatia, which is twice as more than in the entire 2017. In BiH, the highest number of refugees and migrants gather in capital Sarajevo or in north western BiH, close to the border with Croatia. About fifth of them say they come from Syria, while the rest come mostly from Iraq, Turkey, Algeria and Afghanistan. In the past weeks, an assessment of the situation of migrant and refugee children, including unaccompanied and separated children in BiH, was completed and a coalition of international organisations working in the child rights sector in BiH was formed, consisting of UNICEF, World Vision, International Forum of Solidarity – Emmaus, Save the Children, and SOS Kinderdorf, with technical support from IOM, UNHCR and the UN Resident Coordinator’s Office. Following the analysis of the needs in the field, our team will be active in two regions with the highest concentration of refugees and migrants. In Bihac, the mobile Child Friendly Space is already active, while preparations are being made for a Mother and Baby corner. The same activities will be undertaken in Sarajevo. Child Friendly Spaces provide a safe environment for the youngest where they can regain the sense of normalcy and structure through organized activities of playing, socialising and learning. Here they can express their fears and reasons for joy. This way, children can rebuild their resilience that will enable their further development. 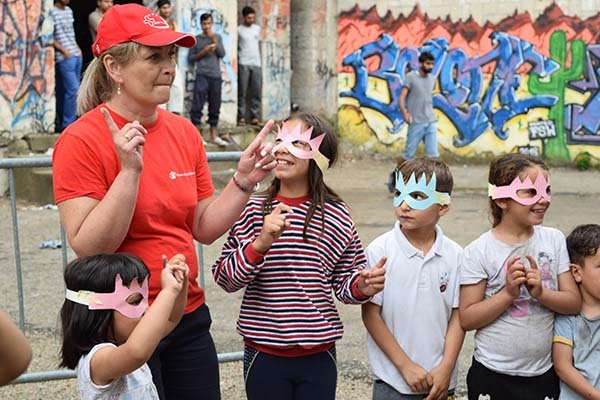 This is a model Save the Children implements widely in places of crisis and has been in use by our team in Serbia, working with refugees and migrants. This experience proved to be invaluable for newly formed teams in BiH who benefited from attained knowledge and shared experiences. Our team member, Alen Keric, was particularly saddened after his first field day. Having fled his home during the war in BiH when he was just six-months old, he only now realized what it means to be a refugee. “There were moments when emotions were overwhelming, but you have to hold-up and focus on the child’s needs. In a total chaos, we were there to give children a safe space, at least temporarily. We got to hear stories from people who were travelling from four months to a few years already. We met children who were born while their parents were travelling,” Alen shares his experience. In the weeks to come, Save the Children plans to widen its intervention and provide much needed support in the form of food and hygiene products, as well.